had done gone & hit da place!!! Deys 2 mo over to da house of Dobbs as well. Mo to go when I gets 'em from da print shop Thursday...which will be da original green/black color. I did have some sorta turn out like the colorful one when my ink started running low. Tell Buddy & Gloria dat da Queen says, "Heeeeeeeey"! so he didn't EVEN notice "renuion"
Had lunch at Hunt's today . Your poster was on the door!! Talked to Buie on the phone today. Tonight I finished putting together my TIME WARP BOXES of magazines & newspapers from our senior year for the banquet Saturday night. Tell a professional photographer that I'll pay money for a picture of THE CLOVERDALE ELEMENTARY CLASS OF '62 ( There should be at least 8 of us there) , The YJHS BABY CRIMINAL CLASS OF '65 and one of everybody. Unbelievable the number of levels of consciousness this endeavor has stimulated. Mean Gene, our postman & lead guitarist for TOUCH OF GRAY which plays on the quad every Saturday before Bama ball games, took our guitar to band practice tonight so I'll get the results of a full examination tomorrow morning. The prognosis is muy f*ckin' good! and that will increase it's value when we auction it off. I'm stopping by Eufaula on the way down to get Buie to autograph the guitar and some posters. has anyone contacted the radio stations? I'm forwarding your suggestion to Bill J. Moody @ WDJR, Leigh Simpson @ WOOF and David Adkins who's the director for the show. Folks will go f*ckin' off talkin' how much they hated Dothan High. Looking forward to visiting @ the reunion. Nice to see you still have that same devilish twinkle in your eyes! My buddy, N., (sax & most other instruments, class of 1966) mentioned you a few months ago. He was appreciative of your efforts @ a fund raising for one of his friends. Norman Andrews & Concrete Bubble, The Lyrics, Stone Ground - Mike Griggs, a guitar player --last name Johnson, Jimmy Watford. I may have some of the names misspelled or mixed up, but you would probably remember Joe. He said "hello". Another friend there passed away ---forget name-- Etheridge? I pulled a box of school "stuff" out of the attic & saw an article about our 6th grade class at Cloverdale Elementary. ( A Day in May). I remember the May pole. boy, was I terrified of that woman! I copied a photo of the King, Queen and the court to give to Donald. You have done a lot of planning to make the reunion fun. I wish I could stay Sunday afternoon! Talked to El Nixo on the phone tonight and he said Susan & The Dynamics would be an entire chapter in his autobiography. Nashville named Noah Ball. 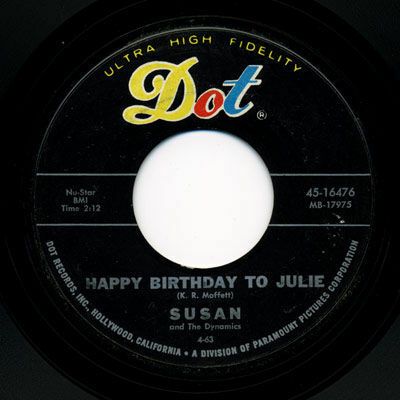 The songs were called HAPPY BIRTHDAY FOR JULIE & Some Day.